La Mano Izquierda is a small press dedicated to publishing poetry and prose from Canada, Mexico and beyond. Our goals are as follows: to produce high quality, beautiful chapbooks for both new and established writers; to narrow the gap between Canadian and Mexican writers through translation and publication; to create a venue where innovative and passionate writing, by writers who are interested in form and rigorous thought, may be read by readers in both English and Spanish speaking countries. Izquierda’s titles so far have ranged from alternating prose and poetry collaborations between a Mexican and a Canadian writer, collaboratively written fiction, published in both Spanish and English, and suites of poems by Mexican and Canadian authors, both emerging and established. We have been drawn less by mandate than by excellence. In the future we hope to concentrate on poetry. Our books are created in collaboration with the author, and with the idea that form, layout and design must respond to and work in tandem with the work itself. Our print runs thus far have been small (75-200 copies) in order to preserve the sense of a book as cherished object, as object of art, and to keep us from entering too deeply into debt. Now, the press has a web presence again, if mainly to offer its authors greater publicity and to mark a (personally delightful) period in time. Many of the books are sold out, but some still have copies still remaining for sale. If interested in purchasing a title, please contact Maleea. Cairo is a chapbook. Surani is a Canadian writer and the author of two collections of poetry. Chilean poet and essayist Andrés Ajens twists language open: his poems stutter, yelp, point, shudder, laugh, lacerate, disobey. They insist on life: the starry addiction to life. Erín Moure brings us a poetry and poetics that we would otherwise not see. She translates Ajens into English with grace and febrility. Perfect bound, Smyth-sewn, printed offset. Erín Moure is a Canadian poet and translator. Mexico City writer Argel Corpus’ first publication in Canada. Bienestar is a 40 page chapbook of sensual imagery and deftly wrought traditional forms. Corpus teaches at National University of Mexico and participated in The Banff Centre’s 2005 International Translation Residency. Printed offset in a billingual edition, Smyth sewn, with French flaps, at 40 pages, Fronteras is LMI’s first perfect bound book. Alanis’ debut publication in Canada uses spare lyrics and a far-reaching eye, exploring landscape, history and borderlands with ferocity and grace. He is an award winning Mexico City poet (now based in Toronto), and operates K Ediciones, which publishes classical and contemporary Mexican texts. Hurricane Isadora hit the coast of the Yucatán in 2002. Intricate, curious and deftly written, Wah´s suite of poems explores the borderlands / fronteras of natural disaster, culture and language. Wah is a Governor General’s Award winning poet from Canada. Isadora Blue was printed offset on acid-free paper. The cover photograph is by French expatriate, Mexico-City-inhabiting Eric Jervaise. A suite of ten beautifully written Ghazals, Simmers quietly maps the resonant landscape of central Alberta’s mountain wilderness. Simmers is a Canadian poet who lived for five summers at Cline Lookout. Sharp and dark short fiction in six parts, written in tandem, published bilingually. Described by the authors as literary tag-team wrestling. Acosta is an award winning fiction writer from Mexico City; Teodoro is a playwright from Canada. The cover photograph is by Laura Barrón. 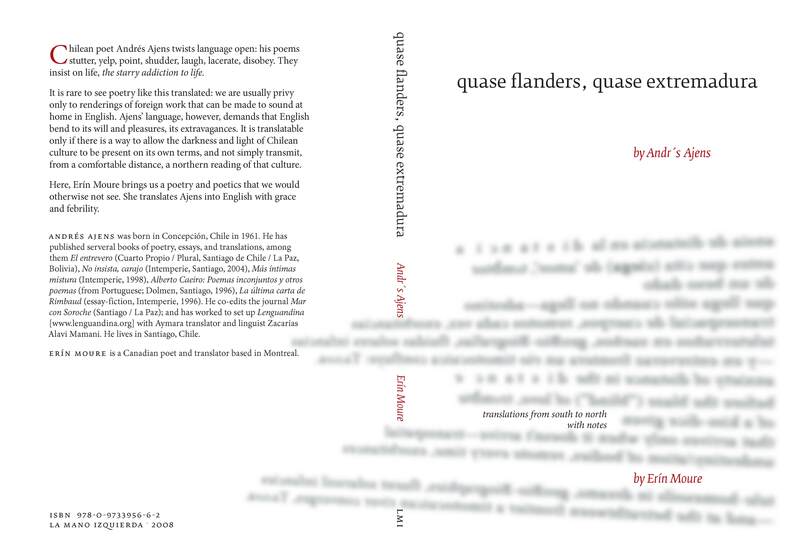 Poetry and prose, a exchange in Spanish and English, in Mexico and in Cuba. Chapbook.